LYLC | What Does LYLC Mean? LYLC means "Love You Like Crazy". The abbreviation LYLC is a light-hearted way of telling someone that you love them a lot. The use of LYLC in text messaging is usually only appropriate between couples. LYLC is not an abbreviation that would normally be used outside of a romantic relationship, except perhaps between young children and very close family members. Sam: I can't wait to see you next week! Grandad: Bye Charlie. Take care of mummy and daddy. LYLC is an initialism abbreviation. Technically, this means it is pronounced using its individual letters (i.e., Ell Why Ell See), but as this is harder to say than "Love You Like Crazy", it is not often uttered using its letters. In other words, the abbreviation LYLC is for efficiency in writing and not efficiency in speech. 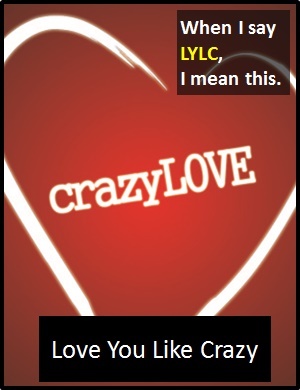 The abbreviation LYLC is normally used as a standalone declarative sentence (i.e., a statement) with the meaning "Love You Like Crazy". LYLC is not often used as another part of speech within a wider sentence. Before the digital era, we might have just said something like "Love You Like Crazy" instead of using the abbreviation LYLC.